I had a great time last night attending a Northwest seafood cooking class at Culinary Communion located in Beacon Hill. It was a 3 hour adventure of chopping, boiling, juicing, cutting, mincing, washing, slicing and more importantly – tasting! Our cooking class was led by Zach, new Culinary Communion instructor who just moved back from Vegas not too long ago after being sous chef at Guy Savoy (if I recall correctly) at Caesar’s Palace. 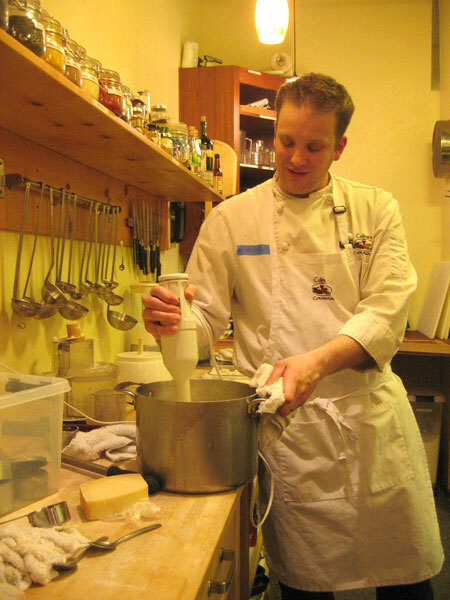 His credentials also include being a graduate of the Culinary Institute of America and chef at Cascadia in Belltown a few years ago. Zach is a great teacher and friendly guy, so he’s highly recommended if you ever decide to take a cooking course at Culinary Communion. We started off the night with a huge table filled with fresh seafood that included whole Canadian king salmon, Manila clams, pacific halibut, Penn Cove mussels (plus two other varieties I forget) and live dungeness crab. Zach walked us through the varieties of sea life, methods of cooking and also great tips on places to buy seafood. He stated that for the regular consumer, Uwajimaya provides great, fresh seafood in addition to excellent prices. For whatever reason, I was never sure of the seafood at Uwajimaya, but I think I’ll give it a shot with Zach’s recommendation. 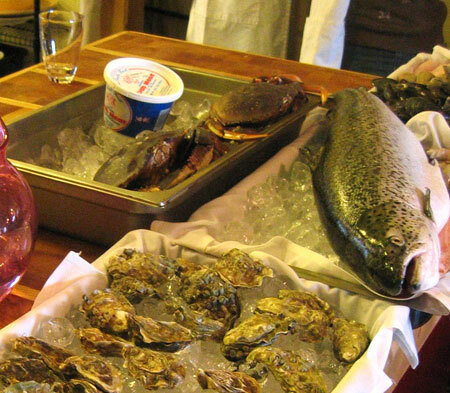 For those in the city, Zach also mentioned that while the Pike Place fish tossing troupes might seem like a tourist trap in terms of price gouging – they are more than willing to negotiate prices with locals if they think you know about the gig. A couple of neat things that we learned about our various seafoods were that farm raised salmon will have white tongues as opposed to black tongues from wild salmon (go with wild salmon). For salmon (or any salt water fish), look for clear eyes as opposed to cloudy to gauge how long the fish has been dead. When preparing mollusks, press down on their lids and see if they retract and clamp back down. If they don’t, that means they’re dead and you should toss them out. An important tip- while you want to soak clams in water, do not soak mussels in water unless you want to kill them. Instead, cover mussels with a damp cloth towel and set aside until ready to use. Among the dishes we cooked, the slow-roasted salmon was a big favorite. It featured a variety of simple ingredients such as butter, lemon, olive oil, herbs and wine, poured over slow cooked salmon fillets. Other dishes that we cooked included:red curry mussel stew, halibut seviche, New England clam chowder and biscuits, bucatini alla puttanesca (I am officially a new fan of bucatini), Peruvian ceviche and fresh Vietnamese spring rolls. 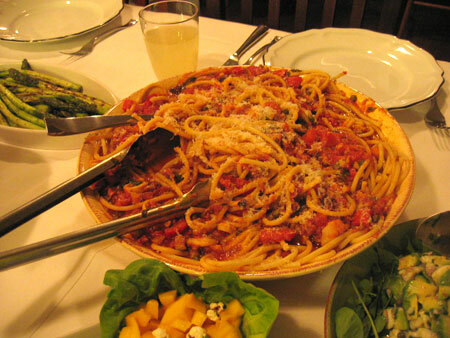 I love the bucatini pasta because it’s a thick spaghetti like pasta that is hollow in the middle, providing more surface area for sauce delivery. If you’ve ever wondered why pasta is always shaped in odd, funny shapes, it’s all to provide extra surface area. The bucatini works great for this purpose and I can see lots of uses in the future for red and white sauce Italian cooking. The amazing part is that most of these dishes were quite easy to make. With a dozen cooks of mixed skill, it was no trouble getting all the food prepped and cooked while coming out delicious. One of the teams forgot to add baking powder and soda to the biscuits, which caused them not to rise and turn out more like biscuitty chewables, but even then everyone had a good laugh and reached for seconds when it came around. - Uwajimaya is great for seafood. - Use LOTS OF SALT when boiling seafood, pasta or blanching vegetables. Like, an entire cup of salt. This sounds scary, but in reality, it works great and won’t send your sodium intake through the roof. - Ceviche is the easiest dish in the world. - If your clan chowder is soupy, blend in a biscuit to add consistency. 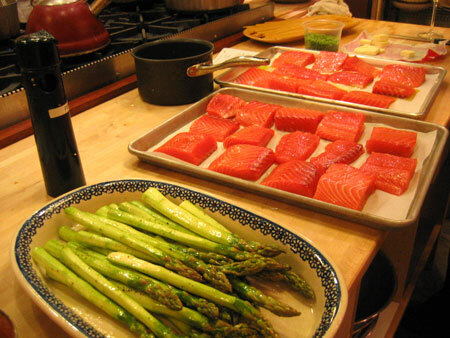 - All fresh fish can be eaten raw; so don’t overcook that salmon. - More butter the better, at least for biscuits. - Shucking oysters is fun. Try it. Hey! I just would like to give an enormous thumbs up for the great info you will have here on this post. I will probably be coming again to your weblog for more soon.